Assembla gives you the power to invite team members, administrators, or contractors to collaborate at both 1) the high-level "Portfolio" level, and 2) the more specific project or "Space" level. 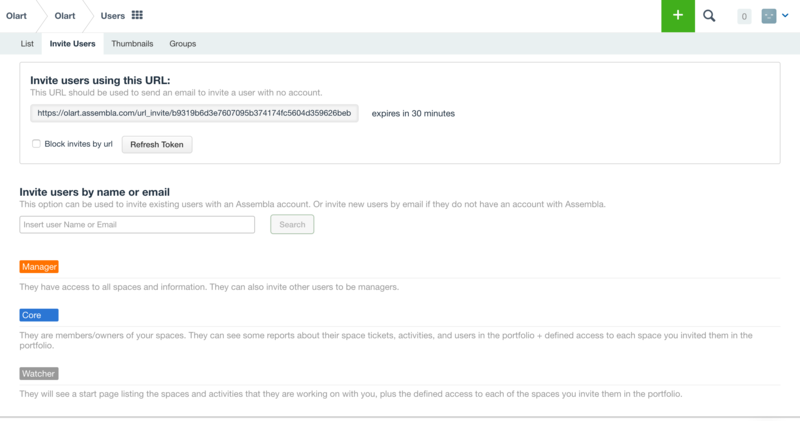 Once you invite users to either your Portfolio or a specific Space, they will receive an email invitation with a link to set up their Assembla user profile. Once they finish setup, they will automatically be added to the Portfolio/Space you invited them to! To add a new user with access to your entire Portfolio, begin by opening the Users tab from the top of the screen. You will then be brought to the Invite Users page. Here, you can either invite a new user by sharing the given URL with then, or by entering their Assembla username or email into the search box below. Users can be designated as either a Manager, Core, or Watcher. For more information on the access and abilities of these roles, check out our article on the topic. To add a new user with access to a specific Space, begin by opening the Team tab from the top of the screen. You will then be brought to the Users page. Here, you can invite new users by entering their Assembla username or email into the search box on the left of the screen. There are also options to Invite people from other teams and to Invite from my Google contacts.